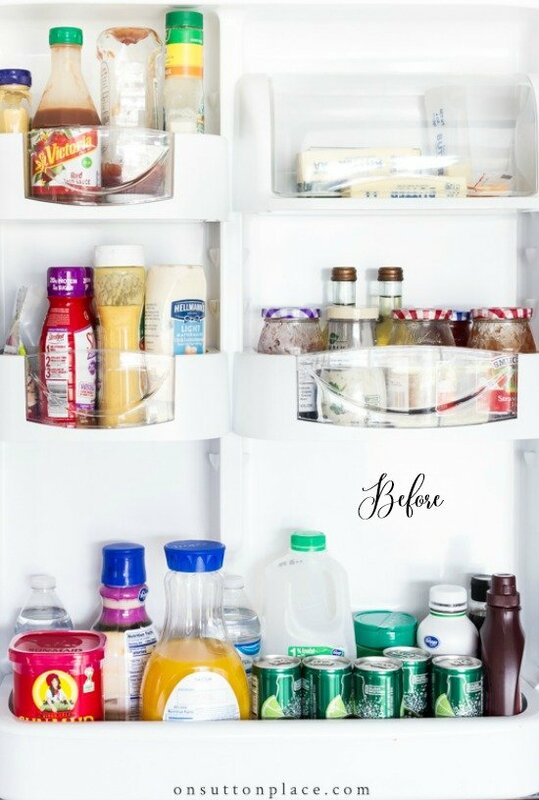 Easy refrigerator organization ideas that work for anyone! Suggestions for drawers, shelves, door, and container ideas. 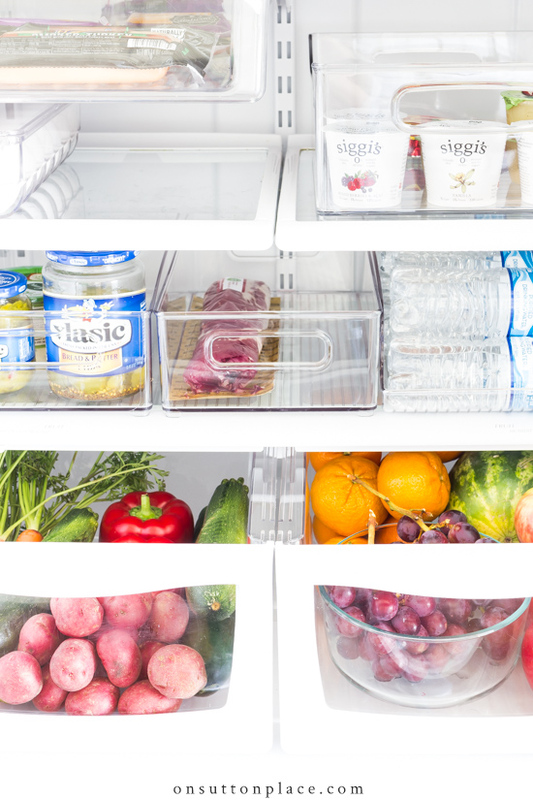 Refrigerator organization made easy! In my quest to embrace our existing kitchen, I recently tackled a kitchen cabinet organization project that has literally changed my life. That may sound dramatic, but it’s true. During the process, I slowly transformed our kitchen from a room I desperately wanted to gut, into a room that is functional and organized. The good things now outweigh the bad, and I enjoy the time I spend there. When the cabinets were finished, the next space that needed attention was our refrigerator. 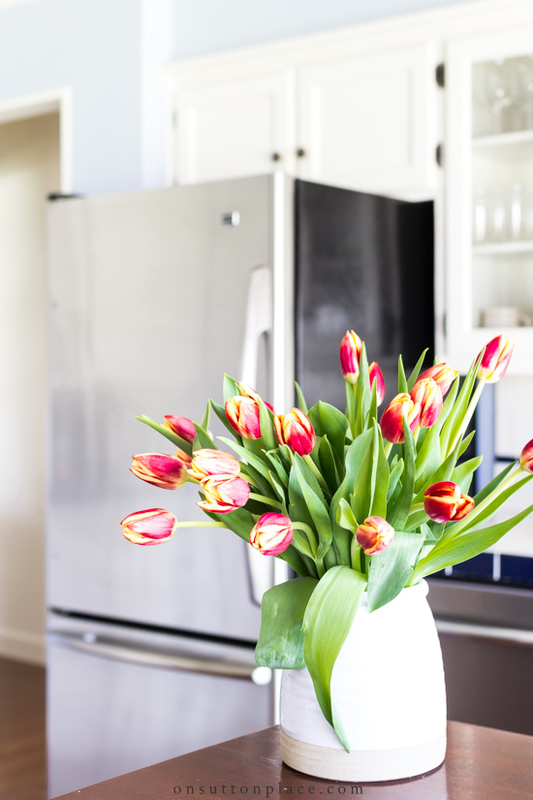 When I chose new appliances several years ago, I was limited to a small selection of refrigerators that would fit the space. 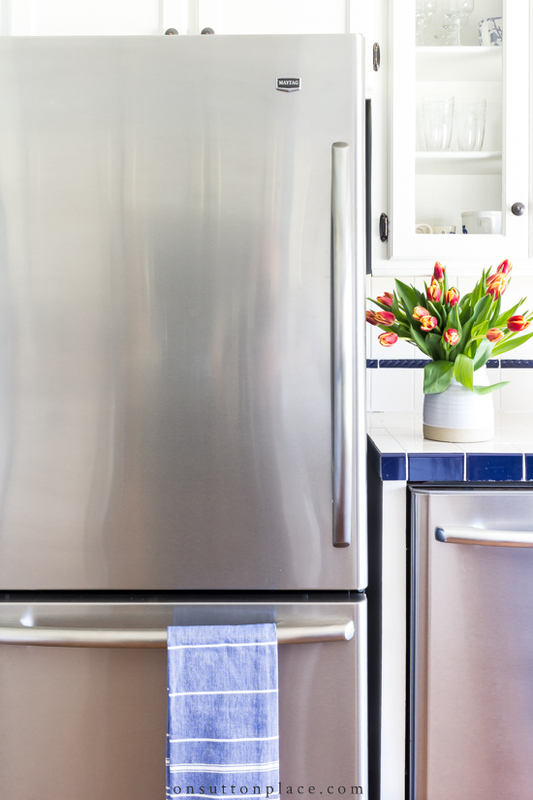 Due to the age and layout of our kitchen cabinets, most refrigerators available were too big. I love our refrigerator, especially the bottom freezer drawer, but the size does present some challenges. Read on for a breakdown of these challenges followed by affordable solutions. The biggest problem with our refrigerator was that due to the small size, it was always over-crowded. Items would get shoved to the back and I would forget they were even there. I was really bothered by the amount of food that was thrown away because it expired before we could eat it. There was no rhyme or reason for where we put things. Random jars would be on the same shelf with lunch meat. Sometimes drinks were in the door, sometimes they were on a shelf. We needed consistency. I had decent storage containers, but the shelves in the refrigerator were not placed so they would stack properly. They were taking up way to much room. 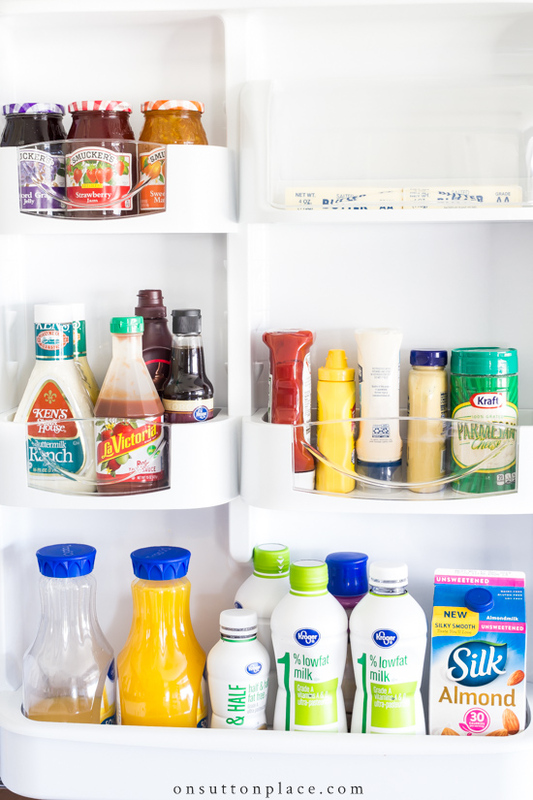 Every item in the refrigerator had to be easily accessible. Like items needed to be placed together in a way that made sense. Better use of clear and stackable storage containers. 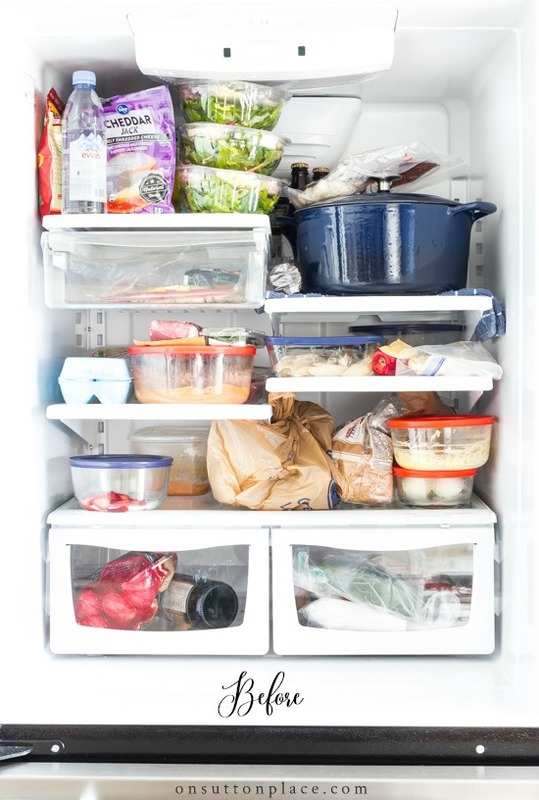 The very first thing to do is look at every item in your refrigerator and discard anything that is outdated. No…you really don’t need that jar of pickles from 2017! Also, get rid of anything you know you won’t use. The next step is to thoroughly clean the refrigerator. I try to keep up with this by cleaning a shelf or two on grocery day as I’m putting things away. For this project, I cleaned the entire refrigerator. One shelf at a time was emptied and washed. I emptied the door and washed all the bins, using Mrs. Meyer’s dish soap. The first thing I did was measure the width and height of my shelves, and then I shopped online for appropriately sized bins. (Everything I used is linked below.) I wanted clear bins with handles that were deep enough to reach the back of the refrigerator. I also purchased soda can and water bottle dispensers, along with an egg caddy. Once I had the shelves organized, I turned my attention to the drawers. I designated one for vegetables, one for fruits, and the small one for meats & cheeses. I prep the fruits and vegetables we eat for snacks as soon as they are purchased. They are washed & sliced so they are ready to eat. Vegetables used for cooking are not prepped until I am ready to use them. *Yes…I store potatoes in the refrigerator. They last a lot longer and I have not noticed a difference in the way they cook or taste. Next was the door. This is where the most purging took place! Large containers were placed in the bottom bin. Like items were grouped and placed in the smaller bins. I wanted to come up with storage solutions that I knew we could maintain. I didn’t want to transfer drinks (like milk or juice) to pretty pitchers. The eggs have to be transferred from the carton to the caddy, but I like being able to simply pull out the egg caddy to get eggs. (Instead of removing the entire egg carton, opening it, and returning it to the refrigerator.) I opted not to use the lid so access would be easier. I completely love being able to pull out a bin and see exactly what is there. No more trying to find things in the wasteland that was the back of the refrigerator! Make sure to leave some empty space. I didn’t end up with as much empty space as I would have liked, but hopefully we can make it work. Don’t forget about lazy Susans. I ordered one, but in the end, did not use it. If you have a bigger refrigerator, I know one or two would come in handy. I still have many more spaces in and around our home that need organized. Our garage is at the top of the list, but that will have to be a project that is accomplished in phases. To look at the big picture is completely overwhelming! Thank Youuu !! Definitely something I need to do, also. Now, if you can help those of us with a drawer freezer, please !! Hello Ann, I sure do enjoy your blog. Your house is so neat and not cluttered! Would you considered sharing some of your meals with us. Also some more recipes? I just enjoy how you do things. I sometimes get bogged down with what to fix for lunch and dinner. I hope you will think about it. Thanks for all of your other recipes I have used some of them. Looks fantastic now, but what about the left overs, I notice the Dutch oven was in the before picture, but not this one. We made the switch to a counter depth refrigerator a couple years ago, I almost think it’s more of a challenge to keep the smaller fridge organized!! Thank you for the ideas! Hopefully there is room for leftovers…I wanted more empty space than I ended up with. Time will tell! Why do you think it’s important to store eggs in something other than the original container? The frig. looks great! I don’t think it’s necessarily important…but I like the convenience. I know some of my readers don’t agree with me and that’s perfectly OK! Ha!! fabulous. the plastic pull outs are JUST WHAT I NEED!! 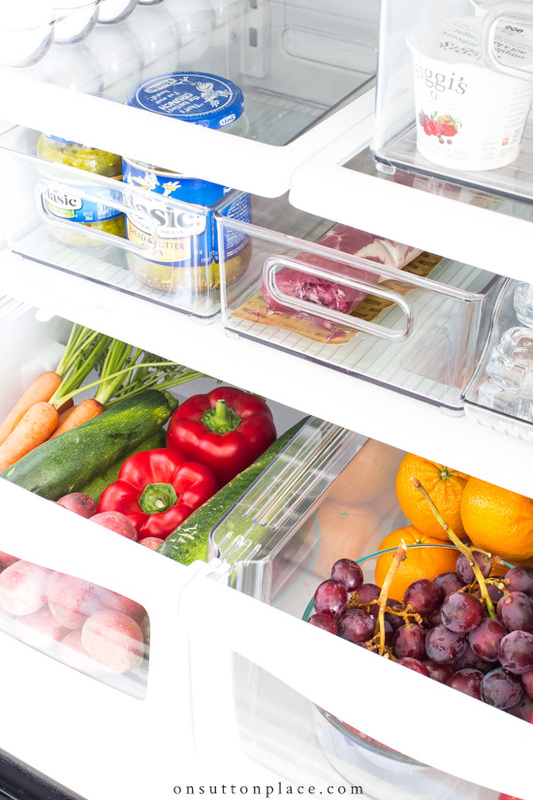 You fridge is EXACTLY my fridge, but mine is white! Our bigger fridge (wider) which did fit, crapped out and is no longer made and this is all I could replace it with!!!! The new ones are taller and I am aware there are people that have to cut their cabinetry down overhead. I am having to cope with my smaller fridge and doing the best I can. Your “bin” idea will help me tremendously. I am NOT A FAN of the side by side and definitely want a freezer on the bottom. My sis-in-law has the side by side with freezer on the bottom in her beautiful remodeled house and kitchen. You know the kind that blends in seamlessly with the cabinetry. It is beautiful but when I am there I have not known which side to open and most importantly the doors overlap and you can’t open EITHER ONE independently. What are the mfr. thinking. Wonderful job! I use clear containers in my fridge as well. I also have a white IKEA container for all leftovers to keep them contained & easily assessable. Appreciated this a my refrigerator gets away from me all. the. time. I too have a bottom drawer freezer and would love to see how you keep it organized with everything easy to see and access. OOPS me again…I agree on the potatoes. Keeping them in the refrig does not affect taste. Great ideas! 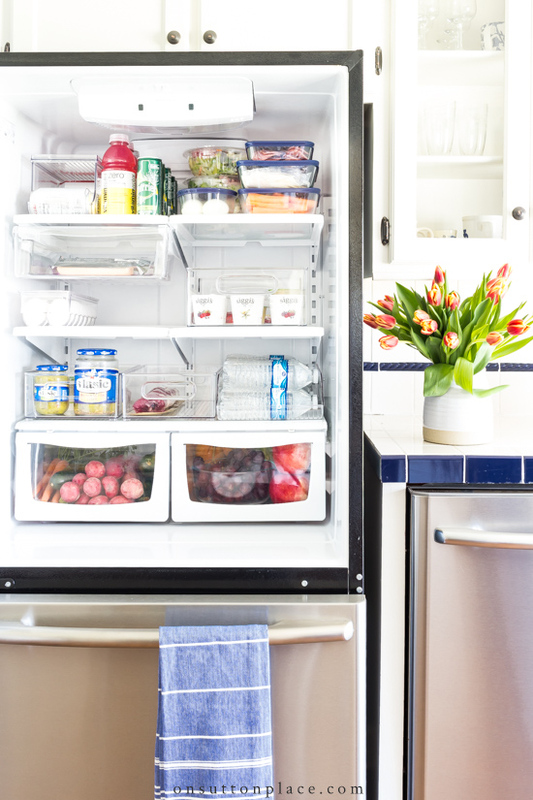 I too have a a frig/freezer combo almost like yours with the exception that the top space has french doors. I have mixed feelings about my choice. I struggle with storage ideas for my drawer freezer. Curious if you have any suggestions or have a system you like. We organized our garage about 10 years ago. Best suggestion I can make is purge, purge, purge. We went with components from the Gladiator System. Two small upper cabinets that honestly we could get by with one. Living in Minnesota we have the need for snow shovels and snow blower. We also store our gas grill and we only have a basic two car no oversizing in width or depth. Keep the wonderful posts coming…LOVE your style! Great job, Ann! I used to live in the north, so I could easily store potatoes in my cool pantry. Then I moved to Texas and there are no cool places. America’s Test Kitchen did a scientific study on potato storage, and what you found was exactly what they found, there is no difference in taste when potatoes are stored in the fridge! That bit of info is so helpful. Love it when my fresh food lasts. I love your blog and your style, and look forward to it every week! Looks lovely! While reading your kitchen reorg posts, I saw those clear containers on sale, so I picked a few to test them out. But, they were a bit short so I solved that problem by putting my unopened jars of food, like relish, salsa, or mayo, behind them. I’m less inclined to then stash something in front of the container. I also use the drawers to store items for breakfast or lunch. It’s easier to pull out one drawer, make the meal, and put it back. Have you tried using mason jars with a vacuum sealer to make “salad in a jar” or at least store the lettuce? It does stay fresher longer if the air is removed. 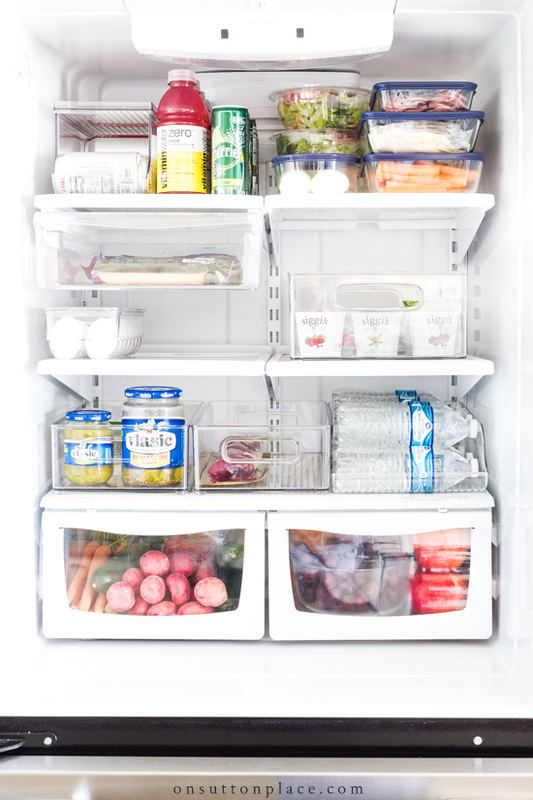 Could you show us your organization of your freezer? I have a side-by-side but I’ll be looking for a new refrig/freezer soon. I often wonder how to store things in a drawer freezer without losing a bunch of items in the very bottom. Thanks! Looking good Ann.I like the clear containers, and yes I keep potatoes in the frig too ! 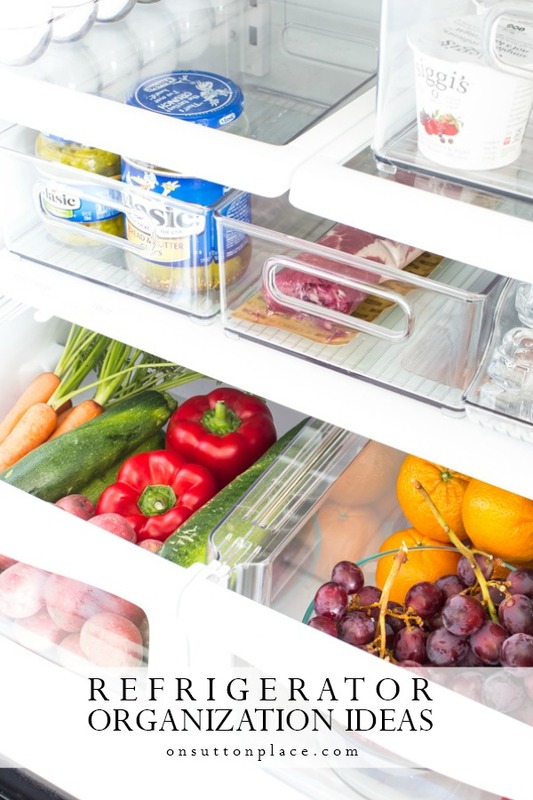 Your fridge looks great, I love it when I clean and organize mine. Always kind of makes me laugh how a simple thing like a clean organized refrigerator can make me happy. I did see a person who was on Home and Family that worked at a refrigerator company showing how to organize your refrigerator and he said eggs and milk should never go in the door. Because of opening the door all the time it is the warmest place, milk should not be put on the top shelf either also because it’s not cold enough (but my milk, juice, water bottle, soda look the best on the top shelf 😂). Wow! What a difference in the before and after. You did a great job. I didn’t know they made water bottle holders. I may get one of these because the water bottles are always falling over. I too hate to clean out the fridge. I made it much easier by lining all the shelves are drawers as well as the door bins with plastic shelf lining from the Dollar Tree. Now I just remove the liner to clean it and the glass shelves don’t have to be wiped out. What will your next organizing project be now that the kitchen is done? Great ideas and bravo to you ! I admit my current fridge situation is exactly like your before pic. Your after, makes me want to do the same. I had the same problem with losing food in the jumble. Thanks for the ideas and inspiration. Another well thought our and executed plan! Good job! Best part for me of all of these is how they help me stay encouraged that I CAN size down things around our home. Everything has a “story” and it is hard to say goodbye. We are not in desperate shape but do have a lifetime of possessions. Forty some years in 2 homes in this community has led to saving MANY treasures. Hi Nanci…I’ve tried the Brita pitcher and did not like it. I don’t like our tap water either. I recycle my water bottles so that helps. Thanks for your comment! I found Brita water to be awful tasting. I have used PUR and it works for me, both the pitcher and the faucet adapter type. I did that a few years ago and what a transformation. I measured the shelves and went to Bed,Bath and Beyond and picked out what I needed. I also adjusted the shelves in such a way that I have more room for tall things, like condiment jars, pickles, wheat germ and they fit not in the door, but in a long plastic clear drawer, adjusted for height. A couple of shelves are very short in height for my glass refrigerator containers. I bought vintage and use them instead of plastic. It doesn’t have a perfect seal, but one should be using stuff within a couple of days so they are perfect. New larger ones are expensive, but totally worth it. Leftovers go in them. Our refrigerator is also on the smaller size. Before I go food shopping I try to toss items that are old. I did our door and found outdated items and items we have not used. The bottom shelf gets cleaned all the time, as it seems to get yucky faster. My elderly aunt is notorious for opening a new product, before the old one is empty.I try to rotate items , that the opened item is behind the new.